Donations left outside the one-story building in midtown Phoenix leased by MVM, Inc., where neighbors saw children being usher inside on June 4. Following an investigation by Reveal from The Center for Investigative Reporting, officials in Arizona are calling for the closure of a Phoenix office building used by a government contractor to hold immigrant children. Neighbors first saw immigrant children being ushered into the vacant Phoenix office building, which is leased by defense contractor MVM Inc., on June 4, Reveal reported Friday. Although it’s unclear how long children remained in that office, neighbors report they didn’t see children leaving until June 22. The building has only a few toilets and no showers, kitchen, yard, bedrooms or other facilities for children. 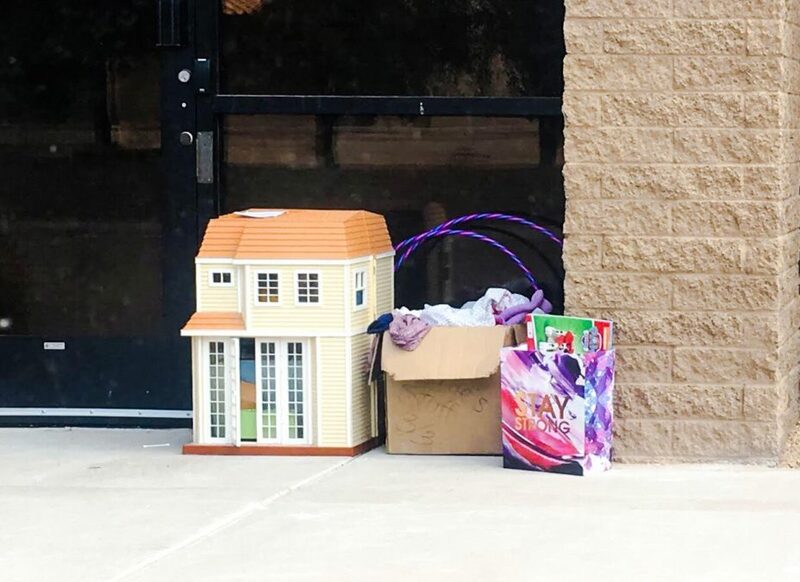 Following Reveal’s story, donations of toys in a sparkly purple gift bag with the words “stay strong” and a large dollhouse were left outside the one-story building in midtown Phoenix. A concerned Phoenix resident also contacted Reveal, stating he had reported the facility to the state of Arizona as an unlicensed child care site. Videos shot by an alarmed neighbor show children dressed in sweatsuits being led – one so young she was carried – into the 3,200-square-foot building. The building is not licensed by Arizona to be a child care facility, and MVM has claimed publicly that it does not operate “shelters or any other type of housing” for children. Doug Ducey is Arizona’s current governor. A spokesperson for the company called the building a “temporary holding place,” not a child care facility. MVM refused interview requests by Reveal, citing restrictions by the Office of Refugee Resettlement that generally limit contractors from providing information to the media. It is unclear whether the company is violating any state or local laws in operating the facility. Any determination about whether the building must be licensed as a child care facility is up to the Arizona Department of Health Services. A department spokesman previously told Reveal that, in his understanding, the way MVM operated its office would make it fall under the state’s definition of a child care facility. But the office’s address isn’t currently licensed to operate as one. Operating such a facility without a license in the state of Arizona is a criminal offense. Farley is a Democratic candidate for governor and faces his party’s primary in August. The winner of that race will face Ducey, a Republican, in the November election. Other officials expected to join Farley at the press conference Monday are Katie Hobbs, state Senate minority leader and candidate for Arizona secretary of state; Arizona state Rep. Lela Alston, and Phoenix City Council candidate Lawrence Robinson. Phoenix City Councilwoman Kate Gallego, a candidate for mayor on the November ballot, issued a statement denouncing the use of the private facility to hold children. “I am deeply disappointed that U.S. Customs and Immigration Enforcement has mistreated migrant children in our city, stashing them inside inadequate facilities not designed for the appropriate care of children,” Gallego’s statement says. Carlos Garcia, a candidate for Phoenix City Council, also condemned the conditions under which the children were held in Phoenix. Garcia is a member of Puente, a group that advocates for immigrants’ rights. Neighbors told Reveal they did not see or hear the children during the three weeks. MVM told Reveal that the office was used for children waiting to board flights at the Phoenix airport, but didn’t know whether children stayed in the building overnight. The company has a contract with ICE to transport children, and neighbors saw numerous white transport vans pulling up to the building to unload children there. Records indicate that Virginia-based MVM has received contracts with ICE worth up to $248 million to transport children. The company was founded by three former Secret Service agents. MVM signed a five-year lease for the Phoenix office building March 9, one month before U.S. Attorney General Jeff Sessions announced the new “zero tolerance” immigration policy. Children were first spotted entering the office two months later. Elzea confirmed that, according to the agency’s contract with MVM, the building is not for overnight use. “The offices are outfitted to provide minors awaiting same-day transport with a more comfortable and private atmosphere than they might otherwise have at a public transportation hub,” she said. While it is unclear whether any of the children were separated from their parents as part of Trump’s family separation policy, the ages of several children indicates that they it’s unlikely they arrived at the border by themselves. Several were toddlers, and one was too young to walk into the building on her own. Generally, children who have come into the United States as unaccompanied minors are teens and pre-teens old enough to navigate the perilous journey without a parent. MVM holds a five-year lease on the Phoenix building and workers indicated to neighbors that the company planned to resume holding children there in the future. After the children were removed June 22, workers told neighbors they were repairing the air conditioning, while temperatures exceeded 100 degrees in Phoenix.